A few products that I think are pretty awesome just because they make my life easier. I recommended this in my Winter Skincare guide and it's a product that I've been using regularly and love. I usually pat it on my face about a half an hour before going to bed. This mask has a gel-like texture with a cooling feel and a light floral scent. The best part is that I wake up to smooth, hydrated skin. Gotta appreciate the effortlessness of this! I'm big into cowashing and was using Wen Cleansing Conditioner for awhile. I actually love it but didn't love the price. This chemical-free and cruelty-free product is the most comparable I've found to Wen in terms of how it works and it's a fraction of the price. The consistency is thinner so you don't have to use as much of it and the coconut scent is lovely. It leaves my hair clean, soft, shiny and manageable so I'm happy. It also comes in Rosemary Mint and Sweet Pomegranate if coconut isn't your thing. Cleaning my makeup brushes is a must but it feels like such a chore. I actually don't mind cleaning my brushes every week since I started using this gentle goat milk cleansing balm. I just wet a brush, swirl it around the balm, rinse and repeat until the water runs clean. And to refresh and clean the balm, you just rinse it with hot water and wipe away any residue. Such a simple way to get clean and soft makeup brushes. Those look like really great products. I'm interested with the brush cleanser. Ah, Wen. I remember those terrible infomercials/commercials on my tv from time to time. Heard the products are a hit or miss with some people though! LOVE LANEIGE'S SLEEPING PACK, MOSTLY BECAUSE OF THE GEL FORMULA. It sinks it so quickly, which is nice when most of your moisturizers are the type to sit on your face for hours on end. Everything sounds amazing, but we especially want to give the mask a try!! That overnight mask sounds like something I could use! 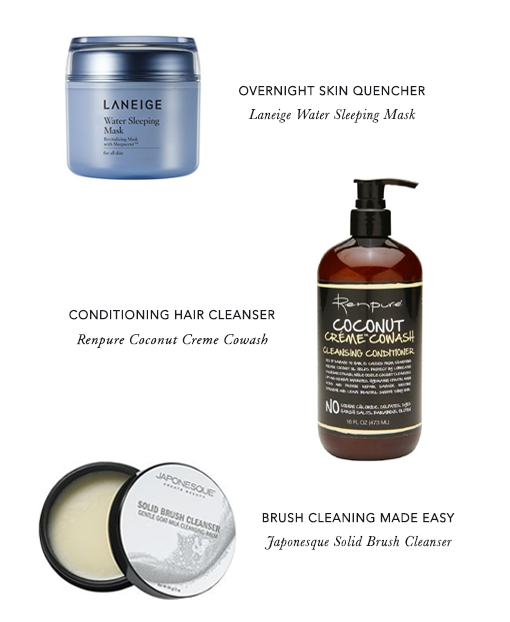 I will like to try the coconut cleansing shampoo sound amazing. Have a wonderful weekend. That coconut cleansing conditioner sounds amazing but it would be a tough choice between that one and the rosemary and mint - both such lovely scents! I'd love to try them, thank you for sharing! I'm like you, hate cleaning my brushes and find it to be too much work. LOL! Will need to check out that balm. I have a sleeping mask by Olay but almost never use it, it's also water based. Maybe it's time for me to take it out and use it again, hopefully it'll help with my dry skin no thanks to winter. Love the hair cleanser!! Great products for sure! These products sound good, I would like to try them all!!! Great picks! The conditioning hair treatment sounds good. Rowena, co-conditioning is helping my hair. I'm currently using WEN fig. I tried some other brands and they were not really helpful, so I'm back on WEN. Will look into that brand. I hate the idea of tackling brush cleaning so much that I actually have never cleaned my make up brushes. I know this is bad, but the whole thing seems like such a chore. I will have to try this brush cleaner. The coconut is really good! Hey that brush cleaner sounds good. I have not washed my brushes, I wash my cosmetic sponge, I will have to look in this. last year i shared a post on my fave solid brush cleansers and it was just hated. it bummed me out bc solid cleansers are so much faster and are awesome for sponges--the fastest i've found. i LOVE them. The brush cleanser sounds really nice! I've heard so much great stuff about the sleeping pack and the way you described how effortless it is makes me want to go out and buy a jar right now. I didn't know about cowashing or a cleansing conditioner, I always felt that conditioner couldn't cleanse. This explains the price tag. The solid balm brush cleaner is also the first that I come upon. I'm using a very cheap Daiso sponge cleaner that's raved about by beauty bloggers in Asia for being cheap and good. They look like great products. The conditioning hair cleanser is on my list. Have a great week. I really want to try that sleeping mask. OK, that brush cleanser sounds awesome. Totally want it! i have never heard of brush cleaners! and the water mask sound so soothing and hydrating. my skin is always battered during the winter. I have heard about Laneige for years but never try their product line. I do love Korean skincare though, they seem to work really well with my skin. I am currently using another Korean brand and love it. I really need to give that product a try. Thank you for sharing, Rowena.